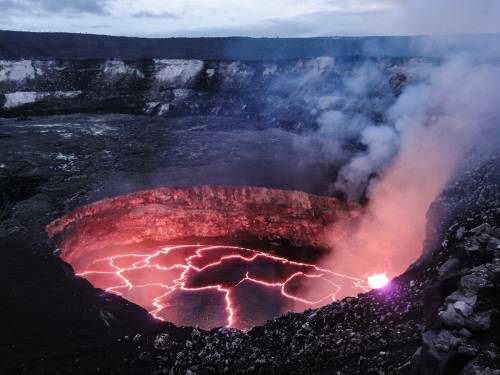 LOUISVILLE — The threat of more eruptions, explosions and lava continue to keep geologists on alert as they track activity at the summit of Hawaii’s Kilauea volcano. The U.S. Geological Survey (USGS) says lava draining from the volcano could pose serious problems and officials are keeping watch. Pagalaboyd, who is also administrator with Christ Church Uniting Disciples and Presbyterians, says the uncertainty has everyone on edge. Pagalaboyd adds that they have no idea how long the threat could last. Authorities have warned impacted residents not to wait too long to get out. Pagalaboyd says despite the evacuations, few residents are taking advantage of shelters that have opened. Pagalaboyd says they’ve been in touch with Presbyterian Disaster Assistance regarding long-term recovery. Presbyterian Disaster Assistance has been monitoring the situation in Hawaii and is in communication with Pagalaboyd. The immediate threat is in a national park with a sparse population. The nearest community is approximately three miles from the summit. Presbyterian Disaster Assistance is able to quickly respond to emergencies because of gifts to One Great Hour of Sharing.